Eagle Aluminum Cast Products (EACP) provides a wide variety of aluminum casting services, and is able to meet any aluminum casting need. We proudly hold to the standards of the Aluminum Association for permanent mold and green sand castings. EACP’s aluminum casting services center around two separate processes for producing aluminum castings. Typically cast iron or steel tool / mold (4140 or H13) is used as the mold material and the cores are made from sand. Cavity surfaces are coated with a thin layer of heat resistant material / dycote. Cavities and gating are engineered and machined (CNC) to customer part models to run effectively by eliminating shrink or any other voids in the product. Permanent Mold castings are produced with tight tolerances (+/-.015 – .020″) and a smooth cosmetic surface finish (125 / 175). With the adequate % of silicon in the aluminum, metal can flow to tight areas allowing for thin walls (.100″) to fill consistently. Patterns are made out of aluminum, wood, or plastic material. We have 3 cope and drag lines (Rollover) and 1 match plate line (Rota-Lift) with multiple flask sizes ranging from 16×78 to 33×78 (Rollover) and 20×28 to 18×40 (Rota-Lift). The green sand is a mixture of sand, clay mix & water to support a solid forming mold within minutes. 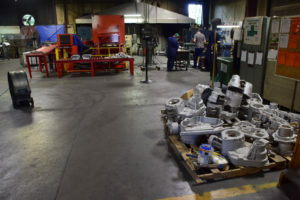 Green sand castings are produced with +/-.030 – .060″ tolerances and a surface finish (150 / 350) that is a little rougher than the permanent mold process. Min. wall thickness required around .250″. Our niche at the greensand foundry is in the paint support business (Automotive Paint / Assembly). We can be competitive with larger castings (10 lbs. +) or low volume small castings. We do not have automatic machines to support high volume small castings but are happy to review for quote to see if project fits. EACP’s broad range of aluminum casting services includes a robust mold and pattern design department. Using our years of experience and knowledge, EACP can determine the best method for producing your casting. With the aid of simulations and experience, we are capable of providing patterns that require very little, if any modifications. Our Pattern Shop specializes in Green Sand patterns and has been expanding into making permanent molds and core boxes. 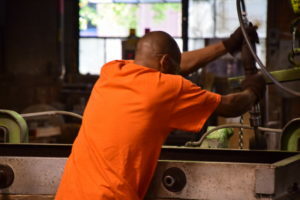 We will go the distance to ensure that your mold or pattern will provide a quality casting. Eagle Aluminum is capable of providing a complete casting. We work very closely with and manage all our suppliers and the end product is a completed casting. Heat treat, machining, coatings, impregnation, leak test or packaging Eagle Aluminum manages the project from start to finish. Eagle Aluminum maintains an inventory of all aluminum alloy used to produce your castings. We currently pour A356 and 319 aluminum alloy. Eagle Aluminum Cast Products, Inc. is able to take a project from concept to completion by utilizing our many resources. EACP applies an Advanced Process & Quality Planning (APQP) that encompasses the entire process required and will pull in all resources that might be associated with providing a high quality casting. Not only are we able to pull from our Pattern Shop for design and engineering, but from all departments and functions within The Eagle Group. Also, our many approved suppliers are asked to join in our APQP process. Here at EACP, our aluminum casting services include conducting routine chemistry testing of all our aluminum being used for production. Using the guidelines of the Aluminum Association, we maintain our alloys through consistent monitoring and addition of “sweetners” to produce better castability and more sound castings. All of our physical, NDT, hardness and xray is either conducted by our friends within The Eagle Group or by approved suppliers.